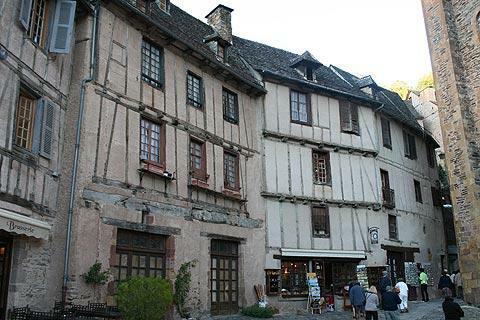 France This Way comment: if you are on holiday in this region of France do not miss Conques! 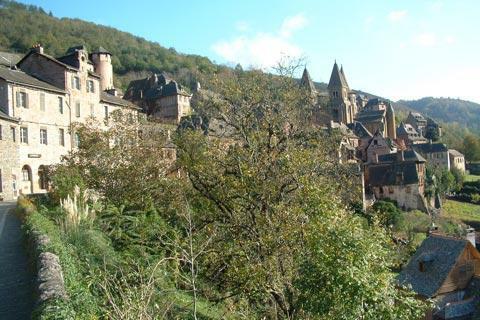 We use a lot of superlatives throughout the site and to describe the 'most beautiful villages of France' - but Conques is really something else. 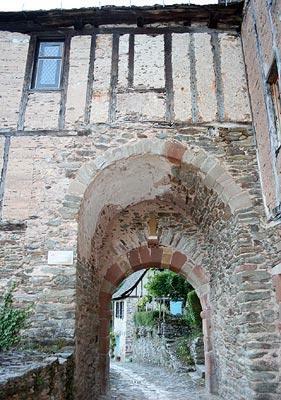 In the centre of Conques, parts of the original town walls and gates survive, sealing in the narrow village streets (many of which are cobbled) and with many fine medieval houses spread out across the hillside - almost all the houses seem to have great views into the valley below. 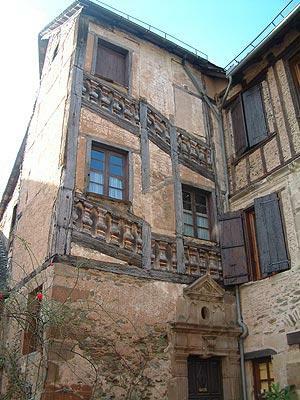 In the 13th century Conques had 3000 inhabitants: it was a bigger and more important town than Rodez, which explains the high number of grand houses and buildings to be seen in Conques. Although the main sights in Conques are the Abbey and its treasury there is a lot to explore elsewhere in the town as well. 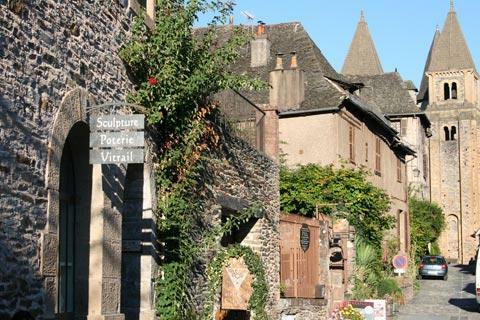 You will come across most of the highlights as you walk through the village, but we do recommend you go to the tourist office to get a plan of Conques which shows the various places of interest including the stone gateways, the communal bread ovens (which still work), the convent, castle and fortifications. 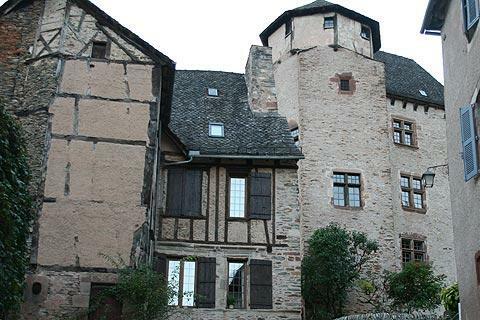 The castle of Conques has a tall octagonal tower. This reaches slightly higher than the octagonal tour of the Abbey and was built like by the original owner in an attempt to put his importance higher than that of the church. The large number of windows are also a symbol of status as taxes were levied on the number of windows and so only rich people could afford to have lots of windows. 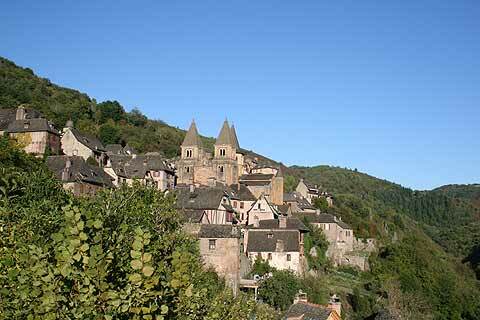 Conques has its origins, like many of the beautiful villages of France, in ancient pilgrim paths. 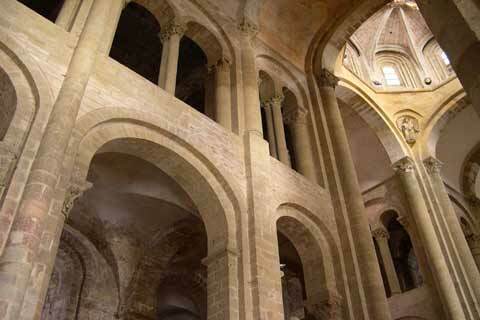 A hermit called Dadon settled here in the 8th century, and soon attracted a group of Benedictine monks to his side. One of those 'obtained' the relics of Sainte Foy (pronounced 'fwa') from Agen and brought them to the monastery, where they soon attracted pilgrims due to their apparent ability to cure blindness. 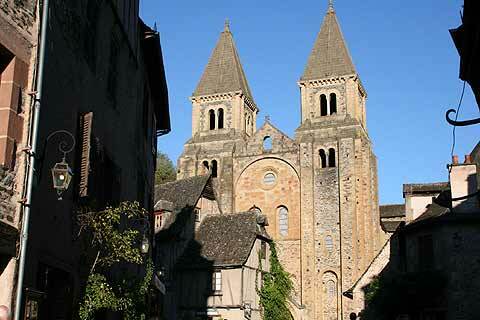 Conques was soon a major stop-off point on the pilgrim route to Santiago de Compostela. Conques abbey was built in the 10th - 12th centuries, and the church and cloisters have an international and deserved reputation for their artistic merit. The Abbey was in part destroyed in the 16th century during Protestant uprisings, and has been subject to extensive renovations during the past 125 years. 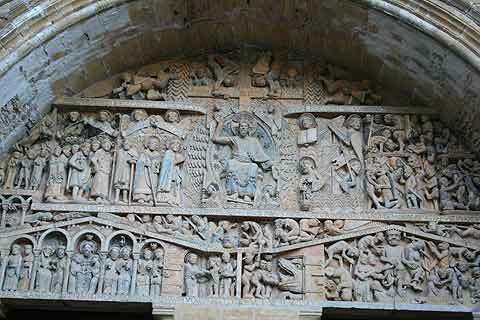 The tympanum (carved 'picture' above the main doorway) of the Last Judgement is considered to be one of the major art works of the 12th century. It really is incredible. There are 124 figures in the carvings many depicting your ghoulish fate if you are unlucky enough to go to hell! Surrounding the main carving are a few figures known as 'the curious ones' who look like little children peeking out from under a blanket at the scenes below. In 1994 all the windows were replaced with windows designed by the contemporary painter Pierre Soulages. Each window has a different pattern but all are in shades of grey. The effect is stylish though very sombre, especially at night. When the sunshine moves around the building lighting up different windows the effect is quite dramatic. 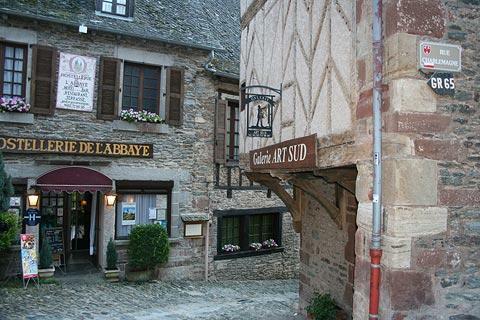 If you are staying the night in Conques during the high season don't miss a night time visit to the Abbey. You will be able to walk round the upper levels of the abbey where you have a fantastic view of the Abbey and the carved chapters. Organ music accompanies you as you wander round and the windows are illuminated progressively allowing you to really appreciate the work of Pierre Soulages. The Sainte-Foy abbey is officially designated as a UNESCO World Heritage Site as part of the pilgim path to Santiago de Compostela. 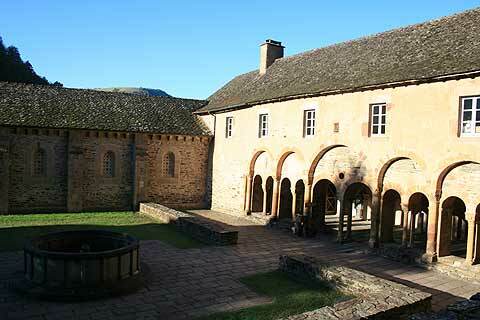 The main treasure in Conques' very impressive Treasury is the statue of Sainte Foy. This is a reliquary which houses the top of Saint Foy's skull. It is known as 'the Majesty' and is a gold-plated statue of St Foy seated on a throne. It is encrusted with precious stones which were donated by many different pilgrims to the shrine. 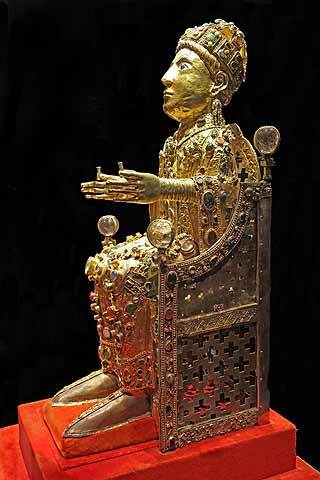 The Majesty is the only preserved example of pre-Roman reliquary statues and is considered one of the top five medieval gold-plated treasures in Europe. There are many other reliquaries in the treasury as well as a processional cross. 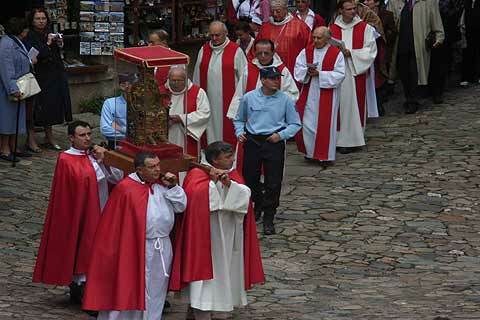 Once a year, on the Sunday following the 6th October, there is a large religious procession in Conques and the Majesty and the processional cross are carried at the head of the procession. When you have finished looking around Conques and the abbey, walk down to the river where there is an asymetric bridge known as the pilgrim's bridge dating back to medieval times which is also a UNESCO World heritage site as part of the pilgrim route, and along the road on the other side of the valley for good views of the whole ensemble. 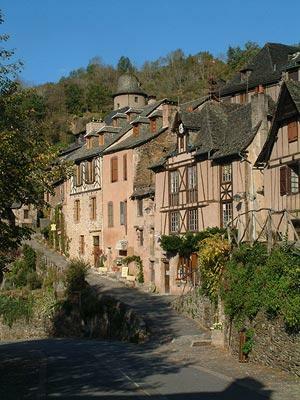 The path to the river is along the GR65 and this is the route the pilgrims take to arrive in or leave Conques. If you walk down the path you pass through the Porte du Barry which means doorway to the suburbs. Hard to imagine the few houses on the other side constituting a suburb but in fact it was in this part of Conques that much of the work was concentrated in medieval times as mills and tanneries were down by the river. Part way down the path there is a small path to the left which leads to the Chapelle Saint-Roch. This was originally the site of the castle of Conques and is an excellent place to get views of the village - especially at sunset. 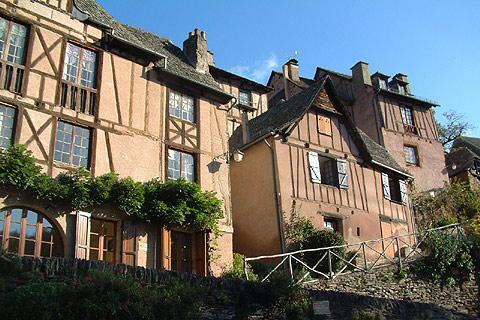 There is a great deal to see and explore in the region around Conques, including Entraygues-sur-Truyère, the lovely village of Belcastel and the medieval city of Figeac.